Manhattan Infidel Calls for the Defunding and Eventual Abolition of ICE! Like many of my readers reader homeless dude who skims my pool, I have recently noticed how controversial ice has become. Many are protesting ice and calling for its abolition. This came as a surprise to me as I use ice frequently in my daily life, particularly during the summer months. Is, as many people are passionately proclaiming, ice racist? Does ice lead to the separation of families? Should ice be defunded and abolished? What would an ice-free United States look like? It is white, the traditional color of racism. So on first glance ice appears to be racist. But I needed empirical proof so I took a 6 inch figurine of Confederate general Robert E. Lee and put it in my freezer next to the ice. The next morning I opened the freezer and the ice had stuck to Robert E. Lee like former Cardinal Theodore McCarrick sticks to a seminarian. Needing yet further evidence I took the ice out of my freezer and placed it next to a photo of civil rights icon Martin Luther King. The ice melted confirming that ice is probably racist or at the very least a white nationalist. Needing ice for the keg I rented I left my fiancee home alone while I went to the store to buy those giant bags of ice. Hence, we were separated. When I arrived back at my place my fiancee was unconscious on the kitchen floor, surrounded by fragments of frosted cherry Pop Tarts, as our cat licked her face. Verdict: Not only does ice lead to the separation of families but it also leads to high cholesterol. And cat drool. Should Ice be Defunded or Abolished? Defunded and abolished are both big words. I shall have to look up the meaning so I’ll get back to you on that. But I suspect defunding and abolishing are good things. 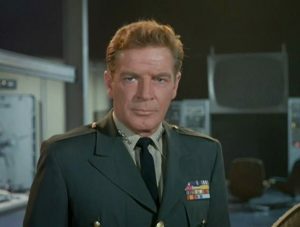 While this is just speculation on my part I believe that an ice-free United States would most likely resemble the face of veteran actor Richard Basehart (pictured here). This is America without ice! Thus, without the racist, destabilizing presence of ice, America would be kind and grandfatherly, yet exuding authority and respect. So it seems clear: Ice must be defunded and abolished. All who disagree with me regarding ice need to be rounded up and shot by a firing squad. That is the American way. I blame global warming. It’s science!